MAKKAYS is a soul distributor for Fluke IG products for Pakistan region. A wholly owned subsidiary of Danaher Corporation (NYSE:DHR), Fluke is a multi-national corporation headquartered in Washington, USA and is the world leader in the manufacture, distribution and service of electronic test tools and software. From industrial electronic installation, maintenance and service, to precision measurement and quality control, Fluke tools help keep business and industry around the globe up and running. Typical customers and users include technicians, engineers, metrologists, and computer network professionals — people who stake their reputation on their tools, and use tools to help extend their personal power and abilities. In addition, Fluke also owns companies: Amprobe, Meterman, LEM and Pamona. Fluke Multimeters: are extremely Rugged, Water Resistant, O-Ring Sealed for Harsh Environments and with highest in accuracy & reliable product design. The Fluke multimeters combine accurate digital and analog measurement capability. They have cases twice as thick as any other DMM. The most popular series include Fluke-80, Fluke-170, Fluke-280 and Intrinsically safe version Fluke-28IIEX series. Multimeters are designed to meet military specification of MIL-STD-28800 for Style A, Class 2 instruments. The Fluke 381, 37X series, 323/324/325 - Clamp Meters and iFlex current probes are rated for safe use in hazard category IV (CAT IV). 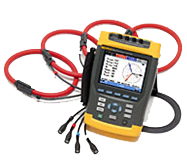 Fluke power quality test tools range is a combination of different products depending on customer requirement and application. these PQAs are ideal for monitoring electronic loads & analysis of existing electrical infrastructure. The Fluke power analyzers are ideal for troubleshooting power quality on switching loads. Additionally, the Hall Effect clamp meter accessories supplied are designed to measure AC/DC currents. The internal memory of the power analyzer enables long-term power quality logging for analysis of trends or intermittent problems. 434 II measures the fiscal cost of energy wasted due to poor power quality. This energy monetization capability allows you to identify the most energy-wasteful areas of your facility so you can determine potential energy saving solutions. Add basic power quality measurements to the package and you’re got yourself one powerful troubleshooting tool. Think of the Fluke 435 II Power Quality and Energy Analyzer as your insurance policy. No matter what goes wrong in your facility, with the 435 II you will always be prepared. Equipped with advanced power quality functions and energy monetization capabilities, there is no electrical issue this model can’t handle. The Fluke 437 Series II 400Hz Power Quality and Energy Analyzer is designed specifically for the defense and avionics industries. Capable of measuring up to 400 Hz, the 437 II is a must-have for those working in submarines, aircrafts, and other transport applications. The new 1555 and redesigned Fluke 1550C insulation resistance testers, offer users digital insulation testing up to 10kV for testing a wide range of high voltage equipment including switchgear, motors, generators and cables.